Atomic Alarm Clock - Set your alarm clock and replace your standard tray clock using different skins. This download (ataclock.exe) was tested thoroughly and was found 100% clean. Click "Report Spyware" link on the top if you found this software contains any form of malware, including but not limited to: spyware, viruses, trojans and backdoors. 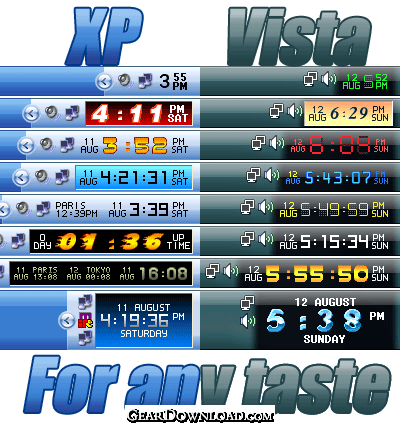 Clock Tray Skins 4.3 - Clock Tray Skins is the advanced replacement for Windows tray clock with Skins. Desktop Tray Clock 2.6 - Desktop tray clock - replace your standard tray clock using different skins. Active Alarm Clock 3.5 - Say bye to the conventional Windows tray clocks. Free Desktop Timer 1.2 - Easy to use skinnable timer for your desktop. Alarm Clock 1.0.62 - This program is a customizable alarm clock with multipul alarms. ShadowClock 5.0 - Analog clock for desktop, clock with transparent arrows and clock face. Dynamic Notes 3.68 - Dynamic Notes is a multi-featured scheduler, reminder, organizer for Windows. 7art Clock Bundle ScreenSaver 1.1 - Get 14 original Clock at your desktop in one single clock screensaver ! 7art Cheerful Clock ScreenSaver 1.2 - Get 14 cheerful Clock at your desktop in one single clock screensaver !